Southern Spain is home to the region of Andalucia and throughout you will find Roman and Moorish influences and its towns and cities bear the evidence of these civilisations, which have dominated Spain's colourful history. A CITO tour by air. DAY 1: Your Door to Door service will transfer you to the airport for your flight to Spain. On arrival, our local coach will then transfer us to our hotel in Antequera, our base for the next 7 nights.  Guided walking tour of the town of Antequera. Meander down the narrow lanes and delightful squares in the old town and visit the Antequera Dolmens, a collection of megalithic monuments over 5,000 years old.  City tour of Cordoba. Home of the Moorish Caliphs and once the biggest city in Europe. Walk through the historical centre with its narrow and crooked street and admire the most beautiful patios of Spain.  Visit the 1,000 year old mosque; the Mezquita of Cordoba, the second largest in the world and a UNESCO World Heritage site. A unique and architecturally stunning building with an imposing cathedral built inside.  City tour of Granada, where highlights include the great Renaissance cathedral housing the tombs of the great Catholic monarchs Isabel & Fernando and the Alcaiceria a maze of narrow, windy streets with many shops selling local artisan products. 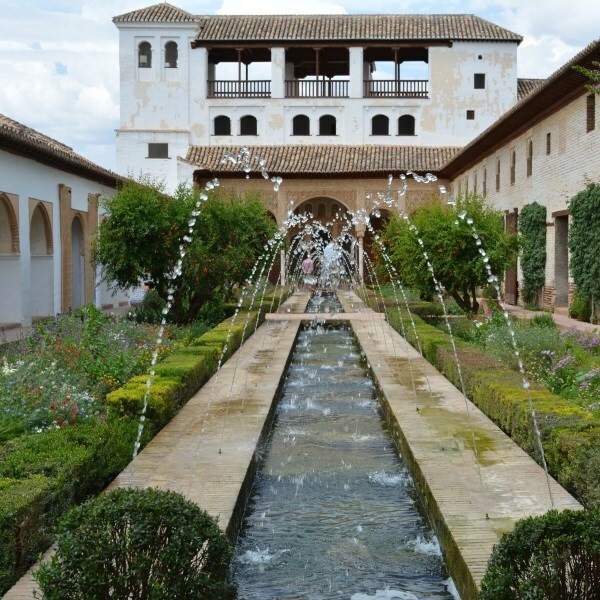  Guided tour of the world-famous Alhambra Palace and the Generalife, the spectacularly situated summer palace with its beautiful fountains and gardens. Please note - Group tickets to the Alhambra Palace are subject to availability and can only be purchased 4 months in advance. In the unlikely event that these are not available, we would offer an enhanced visit of Granada.  City tour of Seville, the capital of Andalucia. Highlights include the beautiful Plaza España, the old tobacco factory and the gracious promenade along the banks of the River Guadalquivir. Also the legendary Jewish Quarter, well known from the operas Carmen, Don Juan and The Barber of Seville.  Panoramic tour of the city of Malaga, birthplace of Pablo Picasso, including a stop at the Gibralfaro Castle where you find the best panoramic views over the city and its harbour.  Drive through the picturesque mountainous area of La Axarquia and stop in some of the delightful small white villages.  Traditional homemade lunch prepared for us by the local Andalucian housewives of Torrox - a great opportunity to interact with local people and gain some insight into the day-to-day life in this fascinating region of Spain.  1 full free day in Antequera to enjoy the hotels facilities or explore this city further at your own pace. DAY 8: Sadly we wave Adios! to Andalucia. Our local coach will transfer us to Malaga Airport for our return flight to the UK and your Door to Door service home. Located on the outskirts of the city of Antequera, this lovely hotel is the perfect base for our tour. The spacious, comfortable rooms feature safe, mini-bar, TV and hairdryer. Other features of the hotel include an indoor and outdoor swimming pool, health club, bar/lounge and Wi-Fi throughout.